AN outstanding Rangers player who was so versatile he could play with equal ease at centre-half, centre forward or in midfield and did so for both club and country. Famously scored the winner at 16 in the 1970/71 League Cup Final and triumphed in Europe two years later. A total of 210 goals mean he will forever be in the lore of the club. Schoolboys dream of football glory. In their imaginations, they soar above defenders to score the winning goal in a Cup Final and become the hero of the hour. Derek Johnstone didn’t just dream it. He did it. He was 16 years and 355 days old when he was picked by manager Willie Waddell to play in the League Cup Final against Celtic in October 1970. Johnstone had made his debut just the month before, scoring twice in a 5-0 League victory over Cowdenbeath. His only other first team appearance had been as a substitute against Motherwell. Waddell’s coach, Jock Wallace, told Johnstone to get a good night’s sleep on the eve of the big game – but the excitement was too much for a teenage kid and he tossed and turned all night. It made no difference. Johnstone knocked the stuffing out of Celtic. He rose to meet a cross, timing his header perfectly and it flashed into the net for the only goal of the game. Not only was it Rangers’ first trophy for four years, it ended a five year run of League Cup successes by Celtic. Not bad for a rookie centre forward! Johnstone, born in Dundee on November 4 1953, signed schoolboy forms for Rangers in December 1968. He turned professional in July 1970 – just three months before that epic League Cup Final win. There was something of the immortal Welsh international John Charles about him. Not just because he was tall and powerfully built but, like Charles, he was equally as comfortable playing centre half as he was leading the line. Johnstone was devastating with his head, but he was surprisingly quick on the ground for a big man. In the European Cup Winners’ Cup victory of 1972, Johnstone played up front in the quarter and semi-finals, but reverted to centre half in the glorious 3-2 win over Moscow Dynamo in the Final. For the next two seasons he played most of his football at centre half, winning the Scottish Cup with a 3-2 defeat of Celtic in 1973. But in the 1974-75 season, when Rangers won the Championship for the first time in 11 years, he divided his time between defence and attack, scoring 14 goals in his 27 League games. 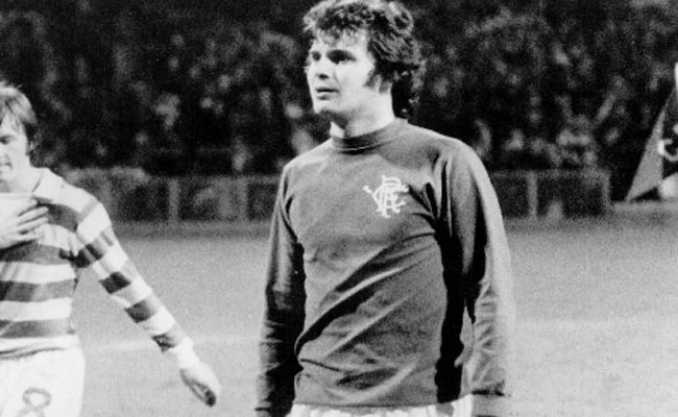 Johnstone, not surprisingly, was Rangers’ leading marksman as they twice won the Treble in 1975-76 and 1977-78. He played regularly at centre forward and scored 31 goals in the first of those Trebles. Celtic were beaten 1-0 in the League Cup Final that year, but Johnstone’s goals in the League and in the Scottish Cup proved vital. The Championship was won with a 1-0 victory at Dundee United in April 1976, Johnstone scoring after just 22 seconds. A week later in the Scottish Cup Final Johnstone actually scored before the official kick-off time! His goal was timed at 45 seconds – but the referee had begun the game early and Johnstone had the ball in the net before the scheduled 3pm start. Johnstone scored twice as Hearts were beaten 3-1 in that Cup Final, making his total seven goals in four matches in the competition. In 1977-78 his season’s tally was 38 goals, 25 of them in the Championship. Celtic were again beaten in the League Cup Final 2-1 and in the Scottish Cup Final, Johnstone got the winner as Aberdeen also went down 2-1. Johnstone, who had won his first cap for Scotland against Wales in 1973, was picked by Ally McLeod for Scotland’s World Cup squad in 1978. Johnstone had scored in two of his three previous internationals, but he was passed over in Argentina – a strange decision given Scotland’s performances in their first two matches. On the domestic front, Rangers retained the League Cup in 1978-79, beating Aberdeen 2-1 in the Final. But in the Scottish Cup Final they needed two replays to overcome Hibernian, Johnstone scoring twice from midfield as Rangers eventually won 3-2. In 1980-81 Rangers again reached the Scottish Cup Final, but Johnstone was left out of the side that took on Dundee United. It was a goalless draw. Johnstone was back for the replay and, though he didn’t score, played his part as the opposition were overwhelmed 4-1. His last club honour came with another victory over Dundee United, this time 2-1 in the League Cup Final in 1981. But in 1983 he was transferred to Chelsea for £30,000. By January 1985 he was back at Ibrox for a second stint. He played 19 League games over two seasons, but he was coming to the end of his career and retired in 1986, briefly to become manager of Partick Thistle. He had played 546 times for Rangers, 14 times for Scotland and among his 210 goals for the club he held a post-war record of 132 scored in League games. That record, later broken by Ally McCoist, was a mark of Johnstone’s class. He was an exceptional centre forward and one of the best headers of a ball Rangers ever had.